Is the kitchen doomed? That’s a fair question when we look at the growth of restaurant delivery startups, such as Deliveroo or full-stack delivery ones, such as Frichti or Munchery. When entrepreneurs are not about delivering food, they offer you fresh meals on vending machines (see the infamous Bodega and the deal below) in your office or train station. All those startups seem to envision a future where we won’t have a kitchen but only a microwave to heat up our meals. If that’s a part of the story, it is not complete. Consumers don’t want to cook every meal, but they want to cook some of them with high-quality products. There is an emotional connection to cooking and pride you can’t have by ordering your meal ready-to-eat. But when consumers want to cook, they want the best product in their fridge right now and not to go to some supermarket shelves. In a few words, consumers are now looking for the exact experience they have with meals but for fresh produce. Is it possible? Apparently, it is. 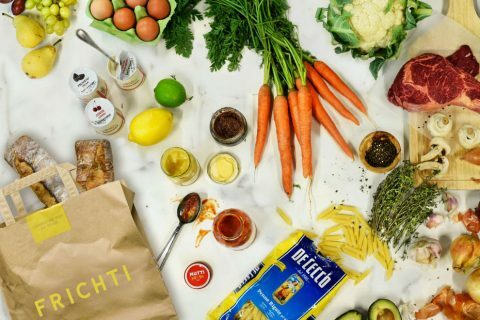 Frichti, the French full-stack delivery leader launched its online supermarket with an offer of fresh produces (one product for one need). You can now be delivered in 15 min will the ingredients you need to cook your meal. You don’t need to plan anything in anticipation but only to cook and eat according to your current feeling. They are not trying to kill the kitchen, they are targeting the fridge! Some want to go further (not by anticipating your needs and ordering food before you know what you want, that will come soon enough) by having an access to your fridge when you are not at home. Franprix, a French retailer is launching an experimentation enabling some consumers to give access to their home (and fridge) to the delivery-man. It is basically what Amazon Key is offering in the US for (Amazon) deliveries. It’s like the marketer’s dream come true: a permission to enter your home! All of this makes sense if we put the pieces together. As we discussed more in depth here, delivery models are merging. 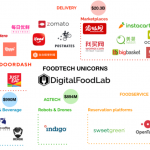 Startups and corporates (such as Walmart and Carrefour with their acquisitions in the meal-kit market) are looking to be your one-stop shop for food by winning your loyalty with more choice and ultimately getting the “permission” to order food before you need it. We should, therefore, see in the incoming months or years better “prime” memberships plans (more than unlimited deliveries) with recommendations based on your taste, benefits if you order both prepared meals and fresh produce, etc. 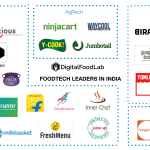 Farmer’s Fridge announced a $30m round (just one year after a $10m with Danone Ventures). 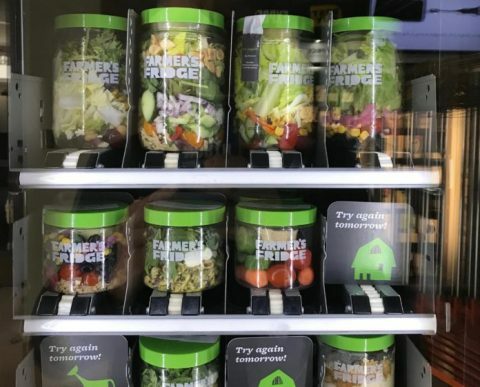 The company offers healthy meals through vending machines, mostly in the midwest (in 186 locations). 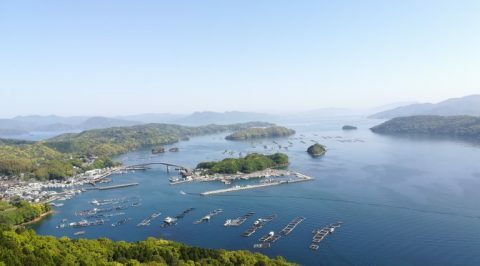 Umitron the asian aquaculture automation startup announced a $11m seed round. The startup helps farmers to give to their fish the right amount of food using data. 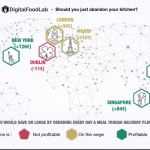 DigitalFoodLab article: are robots the future of FoodTech? More and more startups are working on robots to perform hard and repetitive tasks. 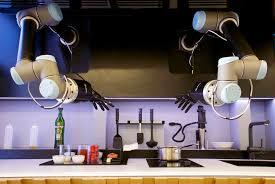 FoodTech is the perfect spot for robots. They start to be used in the fields, in the kitchen, for the service and to deliver food. 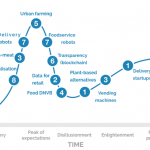 In this article, we give a broad vision for the future of robots in FoodTech. Nima launches a new food sensor to detect peanuts. Have a look at the video in the article. The hardware is impressive if it works as it seems to do. 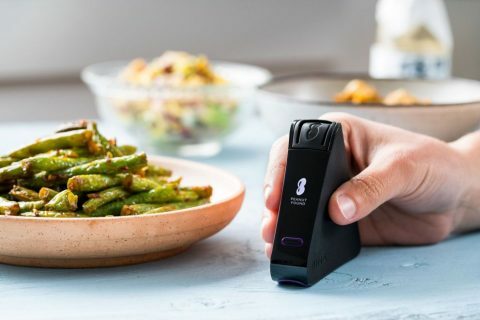 It basically enables any consumer to test on the go some food (e.g. at a restaurant) to be safe about the presence of traces of peanuts. This small and unexpansive hardware (it works with small test capsules) does the work of lab in only 5 minutes.